Mills are inextricably bound up with the Dutch landscape. It is as Dutch as you can get. Many old Dutch masters used to include an imposing mill in their paintings. Today, this picturesque scene can still be admired in real life in our region. 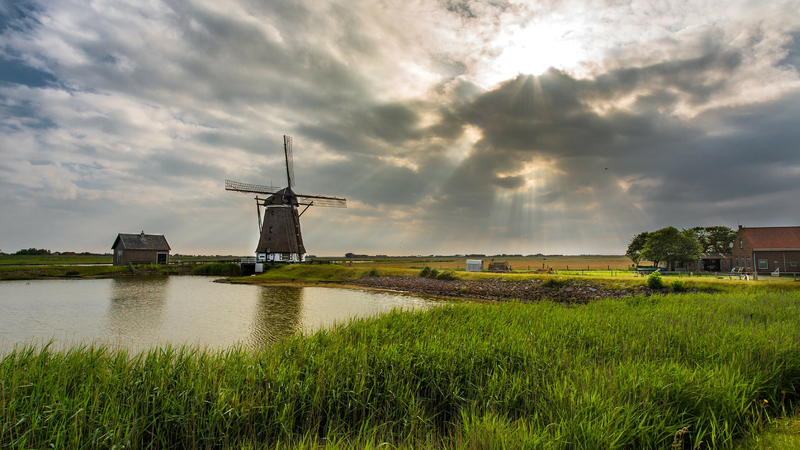 Of all communities in the Netherlands, the community of Kaag en Braassem has most mills! During our round trips we pass several mills. Our skipper is happy to offer some entertaining commentary on the mill. Did you know, for instance, what the position of the sails tells us? The early inhabitants of the bulb-growing area used horse-driven mills to remove rain and seepage water from the low-lying pastures. In the sixteenth century these horse mills were replaced by small wind mills. In the beginning of the seventeenth century there were more than 80 mills in the region surrounding the Kager lakes. Of these 80 mills, around 25 are left today. Obviously, mills are first of all tools. But they are also used as a means of communication. This so-called ‘mill language’ is expressed by means of the position of the sails. There is, for instance, a position of joy, which is used for joyful events such as a marriage or a birth. For this position, the lowest sail is tied down left of the middle. In the event of a death, the miller secures the lowest sail right of the middle. This is known as the mourning position. If the four sails together form a plus sign, people in the area will know that the mill will not be operated for a while. This is known as the short rest. If the mill is not going to be operated for a long time, the miller will position the sails to form an X, which stands for long rest. Join us and enjoy the view of many historic mills around the Kaag and the Kager lakes. For an overview of all boat trips, click here. Welcome on board!